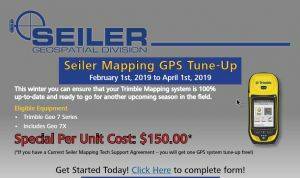 Get your Seiler 2019 Mapping GIS/GPS Tune Up! This winter make sure your gear is 100% up-to-date and ready for another upcoming season in the field. Offer: February 1st, 2019 to April 1st, 2019. See details here and contact your local Mapping GIS sales professional with any questions.